We really appreciate the skill, enthusiasm and hard work that our coaches bring to Saratoga Winter Club! Amy is a 5-time Olympian with 3 Olympic medals. She represented the USA as the flag bearer at the 2002 Olympic Winter Games. Member of the American record holding 3000-meter relay team (4:20.730, Salt Lake City, Utah, 2/20/02). U.S. flag bearer at the Opening Ceremonies at the 2002 Olympics in Salt Lake. Named USS Northern Regional Coach, producing 2 Junior World Team members in three years. Amy is a member of the Speedskating Hall of Fame. Pat Maxwell is a national and North American champion skater. But far surpassing his record as a competitor, is his enviable record as a short track coach. Pat has coached the Saratoga Winter Club since 1976 and is noted for his innovative approach to teaching and development. 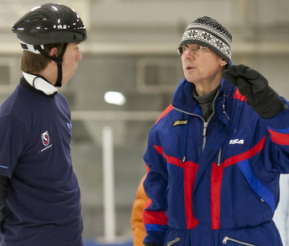 He began informally coaching the Saratoga Winter Club skaters in 1976 and since then has helped many achieve national and international success. Has conducted developmental camps and over 100 training seminars since his retirement from competition. Pat is a member of the Speedskating Hall of Fame. The Saratoga Winter Club is fortunate to have several other coaches regularly working with our skaters in addition to our 3 main coaches. We are proud to have skilled and appropriate coaching for all skill and age levels.